Screenprinting onto t-shirts or bags. This workshop takes a fun hands on approach to printing. Children (and adults) will be designing and printing a personalised bag or t-shirt. Adults too! Adults are welcome to have a go too if they like, although not as comprehensive as our ‘introduction to screenprinting workshops’, if you fancy just having a little taster then you are more than welcome to join in for the same price as a child £19.50. Screenprinting is an involved and instant process that gives colourful results. Perfect for artists young and old. 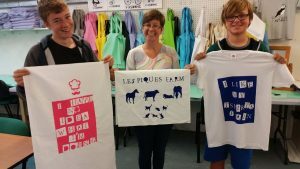 The workshop lasts approximately 1 1/2 hours and everyone goes home with either a t-shirt or bag that they have designed and printed themselves. This workshop is suitable for both children aged 6+ and adults, please note that children 9 years and under will need to be accompanied (and helped) by an adult.